Even though Shaq Diesel went platinum and Metta World Peace had a couple of surprisingly decent songs, most of the times athletes trying to rap turns out to be a disaster. 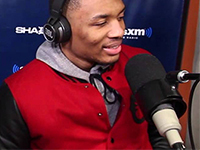 Dame Lillard broke that paradigm when he appeared on Shade 45 with Sway and laid down some real lyrics about growing up in Oakland over Dead Presidents. And my clock was forest gump, it’s spent the long time running.